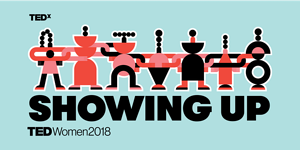 Over at Tedx, this years TedWomen's theme is 'Showing Up'. Women the world over no longer accept the status quo and are rising up, breaking out and pushing boundaries further than ever before. Whatever their focus and talent — business, technology, art, science, politics — these pioneering women and their powerful allies are joining forces in an explosion of discovery and ingenuity to drive real, meaningful change. Versiti's Research Director, Dr. Marie-Claude Gervais has been invited as one of five stimulating women to talk about how they are 'Showing up' and encouraging other women to do the same. Marie-Claude's Tedx talk explores why women want to ‘show up’ and make a difference, but not at the table laid out for them by men. As they ‘struggle to juggle’ between the multiple commitments of home and work life, against a background of austerity that is disproportionately damaging to women, women perceive with greater clarity the need to redesign organisations and society based on more inclusive principles. Simply put, women do not want to play by rules largely designed by men, for men. Other speakers at this illustrious event include Martina Hodges Schell, Teresa Leighty, Dr. Sallyann Freudenberg and Gifty Enright. Alongside Marie-Claude, speakers will be discussing what to do to overcome self-doubt and feel empowered to show up for yourself unapologetically as a woman, and how this also allows you to stand in your own power as a woman for the world to see you, which in turn propels you to the success that suits you. Another talk is about embracing diversity of the thinker and making collaborations more inclusive to all kinds of minds, whilst the final of four sessions focusses on how leadership traits need to evolve to drive impact. Tickets are available for this event here, but if you can't make it and would like to talk to us about gender equality, leadership and what it takes to be inclusive then get in touch.